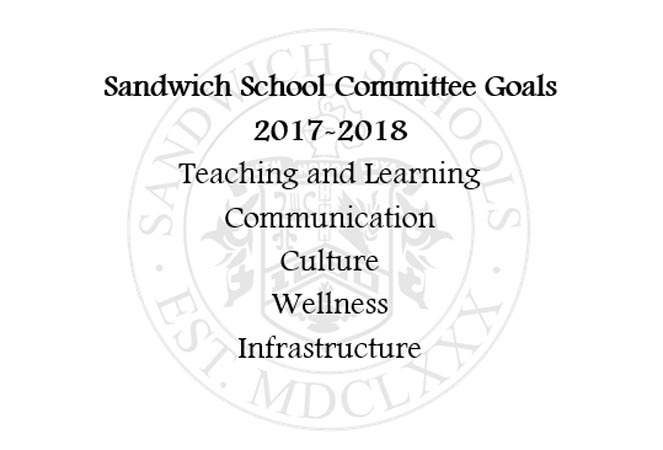 The Sandwich School Committee recently completed work on the creation of the Committee’s 2017-2018 goals. These goals are directly aligned with our newly approved District Improvement Strategic Plan and represent each of the themes presented in the Plan including Teaching & Learning, Communication, Culture, Wellness and Infrastructure. They are SMART goals this year, which aligns with DESE recommendations and also represent their categories of professional practice, student learning and district improvement. The School Committee collaborated with Dr. Gould in the creation of both of our sets of goals so they are truly representative of our best combined plans for 2017-2018. Please always feel free to contact us with questions and concerns at schoolcommittee@sandwich.k12.ma.us. We are looking forward to a great year and thank you for your support of the Sandwich Public Schools!